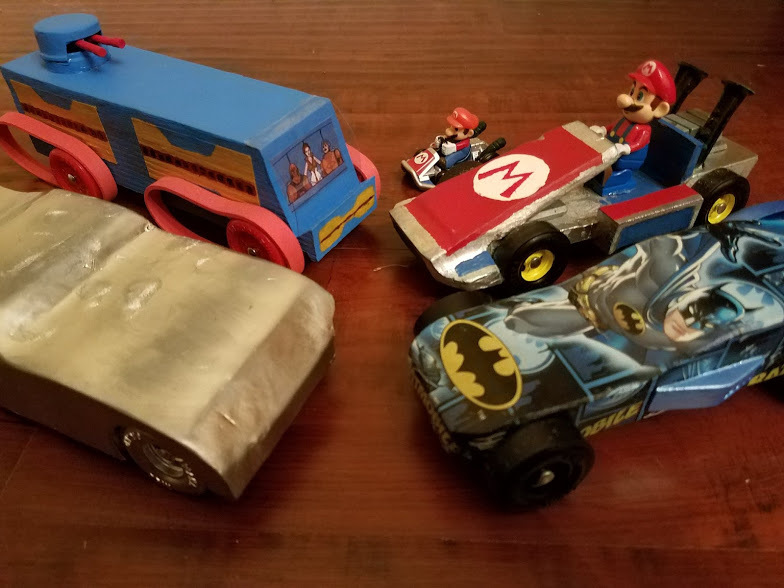 2018 marks the 5th year in a row my kids and I have participated in a pinewood derby race at our church. 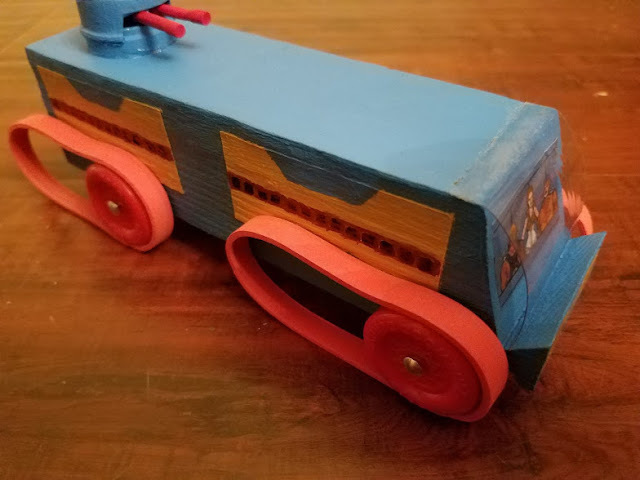 Every year, I've challenged myself a little more to create some unique vehicles for the race. This year, I got off quite easy for what I wanted to build. My usual direction for my kids is to use the material I've bought from Hobby Lobby's clearance section and kept stored away. My middle kid is usually the one that goes outside of the box to something I'm not sure I can even do, but I've been up to the challenge the past two years. 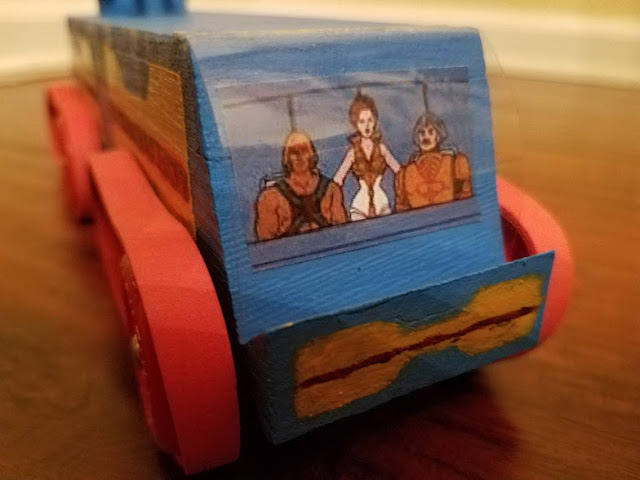 The He-Man and Masters of the Universe animated series was a huge part of my childhood. The Attak Trak vehicle always intrigued me because it was autonomous and could talk like K.I.T.T. from Knight Rider. It also had those incredibly, weird-looking tracks that were fun to watch turn as He-Man, Man-At-Arms and others sped through Eternia. I remember having several of the action figures and toys as a kid but never the Attak Trak (which quite honestly didn't come close to matching the cartoon version except for those weird tracks.) I thought it would be relatively easy to build and fun to look at with it's bright color scheme. 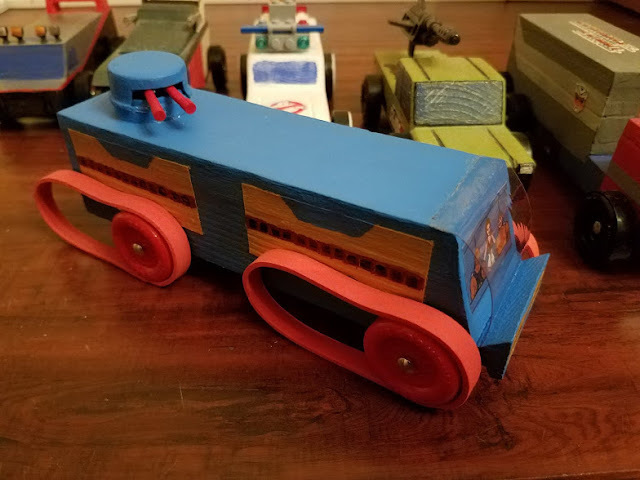 My build started with a standard block of wood and carving out the front bumper (which actually should have been a little taller in comparison.) I cut some clear plastic for a windshield and then printed to scale a screenshot from an actual episode of several characters inside the Attak Trak to glue on the front. For the turret on the roof, I used a piece from a Checker game and a bottle cap that seemed to fit perfectly together. 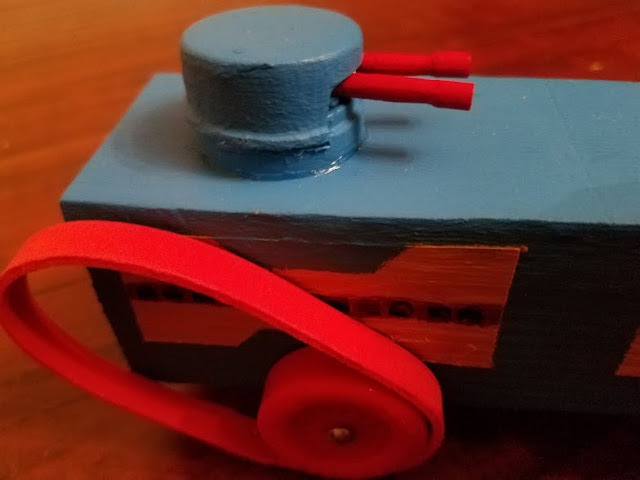 I cut out a section in the bottle cap and cut some pieces of a dowel for the gun barrels. I glued the barrels to the bottle cap so I just sit the cap on top of the checker piece and rotate the turret 360 degrees. 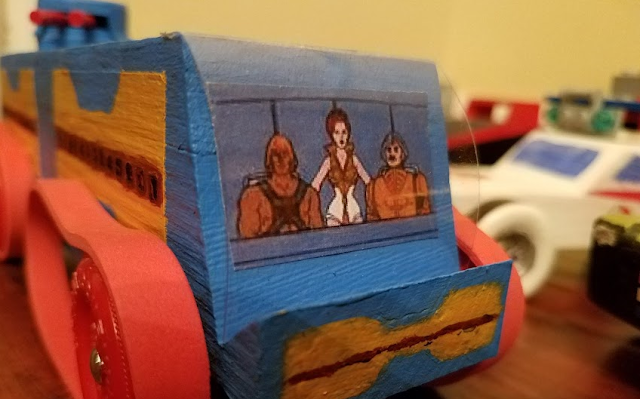 The toughest part of the whole build was the design on the side of the Attak Trak. I tried cutting out a stencil but ended up using painters tape to create a rectangle. I painted the yellow first and just free-handed with blue to create the shape. I used a square bit to dab the black squares along the center and free-handed the maroon color to create the band. Now you are probably wondering if I raced the car with those ridiculous wheels. Absolutely not! I created them just for show so I could actually race the car against the other dads. I purchased red wheels and a sheet of red foam at Hobby Lobby. I cut out a desirable length of the foam and stapled the ends together. I then double-sided some scotch tape and placed directly onto the wheels to somewhat hold the shape of the tracks. 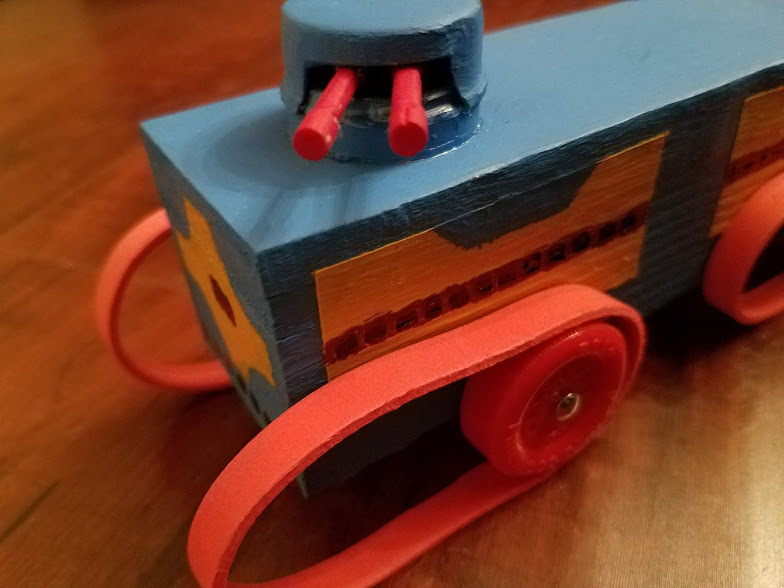 Overall, I was pretty pleased with the end result and while a small percentage of people at the race actually knew what the Attak Trak was, it was still fun for everyone to see. And now seeing it next to my other 80s-themed cars over the past 5 years, it puts a pretty big smile on my face. Follow my progress from this year's build over on the RD80s Instagram feed. 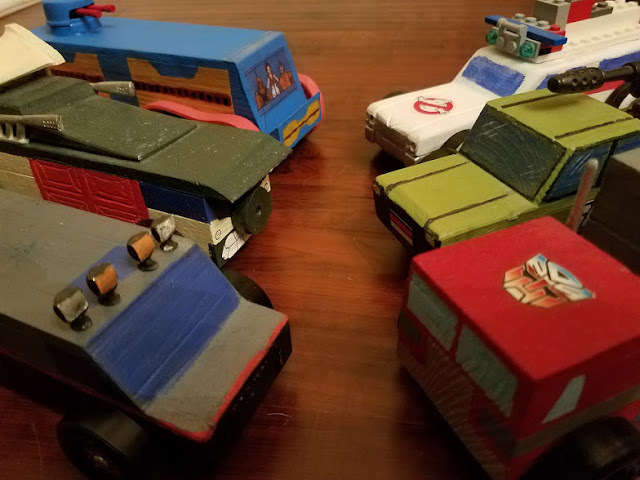 Also revisit my past builds which include Optimus Prime, Ghostbusters Ecto-1 with Lego accessories, the TMNT Party Wagon and B.A. 's van from The A-Team, and a G.I. Joe inspired truck. Leave your comments below on how I did this year and what vehicles should be on my radar for next year!